Place the filled mold on something firm like a small chopping board (to stop the mold twisting). Let the Jello cool then place in the fridge for 30-40 minutes until set. The candies will just pop out of the mold! I made several batches of these with different Jello flavors. They looked so lovely all together, but of course you can do just one flavor if you prefer! The bright colors of the whole collection made them look particularly pretty! These gummy candies will last a few days at room temperature, but if you have made a lot, I’d recommend storing them in an airtight container in the fridge. 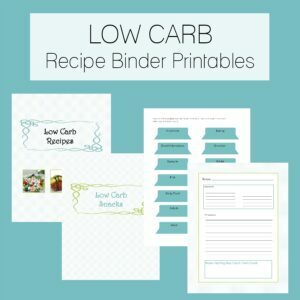 Watch the video tutorial below or scroll down for the printable recipe card! Zero Carb Gummy Candy - a sugar free treat! Cook until all the granules have dissolved - approx 2-3 minutes. Use a jug, squeeze bottle or a spoon to carefully pour the mixture into a silicone mold. Place the filled mold on something firm like a small chopping board (to stop the mold twisting). Let the jello cool then place in the fridge for 30-40 minutes until set. Serving size depends on how much water is used and the size of the molds. 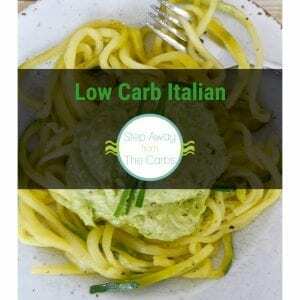 The nutritional data is an approximate amount based on four servings of this recipe. What’s your favorite flavor of Jello? What shape do you want to make?!? Where did you get your molds for the jello? Yes, one envelope of powdered gelatin (Knox or similar) which is equal to 0.25 oz/7.4g. What’s this is teaspoons or tablespoons? I don’t have a scale? The jello and gelatin don’t need measuring; they just use one packet each as stated. ¼ cup of water is equal to four tablespoons. Hi! I made the conversion for you 0.3 oz (is a packet) is equal 0.591 tbsp. I tried these and they’re awesome, yet I wonder if it could be made even more like a gummy worm by making it more opaque and chewier like a trolli gummy worm. Any ideas? I would certainly think keep the water or minimally add because you would need more gelatin. Maybe they could also be made with other flavors? I’m sure this would be more complex, but I’m trying to brainstorm. I also need to figure out how to make sour ones! Lol. If you get to it before I do, I will be so grateful! Check the comments on here and the previous page, Sarah – I’m pretty sure some sour options have been discussed! Try some margarita lime salt, or just use straight up lemon or lime juice in place of the water. Not sure how any of that will effect the composition of the stuff before or after cooking, but should work. I’ve been on the keto diet for a couple months now and have all but fully transitioned, cut out sugar completely, but every couple weeks I’ll wake up in a cold sweat from some trippy Wonka tunnel chocolate river nightmare, and end up cavin’ in for candy. So I’m give these a whirl. I’m also a pepper junkie, I plan on mixin some cayenne or habenaro power in with stuff, I’ll let you ladies know how it turns out. The trick is to boil down the mixture for a much longer time until it becomes more viscous before pouring into the mold. Add blue raspberry lemonade koolaide and Stevia to the liquid version of this recipe. They are sour raspberry tasting. That is the only one I have experimented with today. Haha. I will try more. Citric Acid is what is used to give a sour taste to candies. So lemon/lime juice is an option or True Lemon Powder/packets which is citric acid and citrus zest concentrate. So I tried this: I made a batch of Lime, with 1 pkg sugar free lime, 1 package gelatin, 2 packets of True Lime and 2 Packets of True Grapefruit powders. I added the True Lime packets directly to the gell syrup to make it more tart. I sprinkled one packet of True Grapefruit powder into the half of the wells of the mold and none in the other half, for comparison. I piped warm gel syrup into all the wells. with the second grapefruit packet, I sprinkled just a bit on right after filling the mold, it seemed to sink in. I put the mold in the fridge. At 5 min, 10 min, & 15 min, I sprinkled more powder onto the gelatin in the mold, 5 min, it soaked in, 10 min, it sat on top but still sort of got wet, at 15 min it stuck to the top but didn’t sink in. I left it to finish hardening. Once hardened I removed a sprinkled one and an unsprinkled one. The unsprinkeled definately tasted tarter than regular lime gelatin. The sprinkled ones, well, the only thing that seemed to happen to the back is that it was sorta wet, unlike the unsprinkled ones that were dry to the touch. I think the citric acid sorta wicked some of the moisture out. However the underside, the side that was the bottom of the mold seemed just as dry as the others, and they definately had a POW of tangy-ness. So, If I tried this again ( which I probably won’t :D) I would sprinkle the tart powder citric acid inside the well but not on top, and it will soak into the gelatin so as it dissolves in the mouth you’d have an initial sour experience. Can I substitute pectin for gelatin? Not vegan, just happen to have pectin Sure-Jell on hand. Thanks! I haven’t tried it with pectin, I’m afraid! Hello!!! Awesome recipe, can’t wait to try it! And the gummies will need to be always refrigerated or it gets like actual gummies that can be stored in the pantry? It probably depends on the conditions on your kitchen, but most readers are saying they should be stored in the fridge. I came across another recipe for sugar free gummy bears, it calls for 8 packages of unflavored gelatin, may I ask why there is such a difference between the two recipes? Without seeing the other recipe, it’s hard to answer. How much water was used? How many gummies did it make? I’m need to make sugarfree gumdrops for Christmas cookies. Any suggestions. I was so happy to see your recipe. Any ideas as to what sugar to coat them with and how they do when baked? I’ve never tried baking them, sorry! I love how tart they were!! Awesomely delish!! You could also turn these into “vitamin gummies” by adding Vitamin C powder or other powdered vitamins that did not have an unpleasant flavor. I’m going to do this for my son who was just diagnosed as diabetic and can no longer take his gummy vitamins. 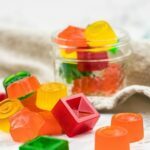 I use the silicone small ice cube trays for my molds and silicone candy molds. I don’t mind that they may be a bit bigger. These look amazing! I do not have molds, would putting it in a baking pan and cutting them up work? I think you’d need something like a silicone mat underneath – but I haven’t tried it, so if you do – let me know how they turn out! Is the water measurement correct? It seems very small. Can I double or triple the recipe if I am making the same flavor? I have moulds about the size of the traditional Gummi bear. About how many will regular recipe make. Is the amount of water correct, it seems very small amount. that Mommypotamus.com does not have zero carbs has alot! Is it normal for them to come out of the mold with a layered look? Top layer is a clear red bottom layer is more of a creamy coloring if that makes sense? What did I do wrong? Oh that sounds strange. Maybe everything wasn’t whisked together completely? Mine also came out this way. When I cooked it in the pan there was a foam like substance on the top. Possibly from the gelatin packet I used, it was off brand. So when I filled the molds and let them set they came out foamy and creamy looking on top and regular gummy looking on bottom. Still tasted great thought! My 3 year old loves gummies but I’m trying to convert him over to eating more sugar free. He loved making these and eating them! 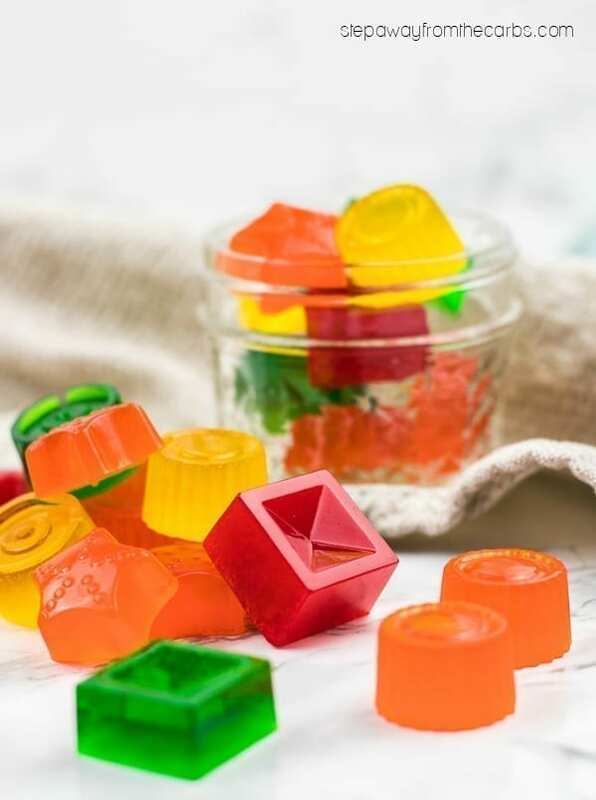 I made these for myself because I love gummies and now I can finally have some. My great grandbaby loves them too. Thank you spool much for this recipe. The gummy candies are delicious. However, I didn’t realize the importance of a silicone mold versus the plastic Wilton brand candy molds. Excited to try the recipe I mixed up a batch of black cherry flavor Jello but they are stuck forever in the plastic mold. A knife inserted around the edge does free the candies but they aren’t pretty like yours. My Amazon order of silicone molds is already on the way. Thanks for sharing a great recipe! You’re welcome! I hope the ones in the silicone work out! Can i put some diet suger in them to make them sweet? The sugar free jello already has artificial sweetener in it, so they will be sweet. How many of those Amazon molds would I need to make one batch. I’m looking forward to being able to eat gummies again. Thank you for posting this. All molds are slightly different, and of course it depends on how much water you add. But very roughly it’s one standard mold tray for one box of Jello. Do you know if I could use Now Food Beef Gelatin for these, or will they taste meaty. 😳 I’m excited to try them. I’ve never tried that gelatin before, I’m afraid. Is it flavorless? has anyone subbed the water for vodka lol? Hmmm, I wouldn’t boil the vodka. However, I would lessen the water, pull it off after boil, and quickly stir in some vodka (the amount of vodka should equal the amount of water you subtracted) until it is well incorporated. Then pour into molds and refrigerate until set. They should be great! Yum! I use natural beef gelatin instead it takes a little bit of playing to get the right texture. I made these today with peach and raspberry sugar free jello and they are AMAZING! I used 1/4 cup of water and they were firm like gummy candies and VERY delicious! I wish I could attach a picture because they came out so perfect! Thanks for the recipe! I love gummies ! Do you have to use sugar free jello or can you use regular jello? It has to be sugar free, I’m afraid. If that doesn’t work for your way of eating then I’m sorry! I made these EARLY on Christmas Day to add to the sugar free treats for my man. The consistency came out great, using 1/4 cup water, plus a tad to account for boiling off. I used a spoon instead of a whisk so I wouldn’t introduce air bubbles, and cut down on the foam in the molds. I made the sugar free raspberry and lemon flavors. Initially they have a great flavor, but then a sodium type taste overwhelms it and I have to spit it out. I boiled them until they foamed, thoroughly mixed them together, and the ingredients were purchased yesterday. Has anybody else have this happen? I expected a nice taste, but they taste ruined to me. My man hasn’t tried his “Christmas treat” yet, so I haven’t heard his opinion on them. Should I try adding some sucralose? Any other ideas? I really want these to work out, I would LOVE to use this recipe regularly. Thanks! 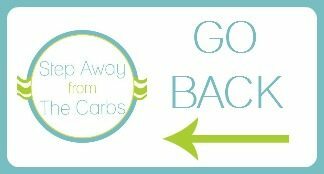 Maltitol is from the devil, and I’m tired of gut-aches from wanting sugar free gummies. After my last bout of craving and buying SF gummy bears (Brach’s. Ate 5 pieces and felt like death), I searched “keto gummies” and found your post. I made these today, using 8 different jello packets for some variety. My silicone molds are mini cupcake sized (I ordered smaller ones after I made these delicious treats), so I only got 3 coins per flavor, but I cut them into four pieces each. Next time, I’ll try them with 1/3 cup water because they are a little bit chewier than I prefer, but they are amazing! Thank you for sharing your recipe! I’m so happy that you like them! And I agree with you completely about maltitol!!! I’m stunned by how many companies still use it for their SF products! They sound great! Thanks for sharing!